Matilda was born Matilda Gilchrist-Clark in 1871, the second child of John Gilchrist-Clark of Speddoch, Dumfries, Scotland and his wife, Matilda Caroline Gilchrist-Clark (nee Talbot). 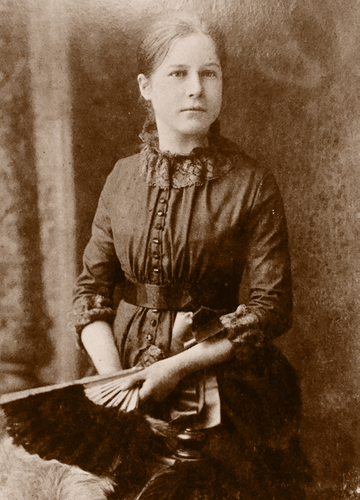 Her mother was the fourth child of Charles Henry Fox Talbot of Lacock and one of the pioneers of photography. She was brought up in Dabton, which as Matilda put it, was "a rather dreary Victorian building in the country" and some 16 miles north of Dumfries in Scotland. Her father was Agent, or Chamberlain, for the Duke of Buccleuch at Drumlanrig Castle, having been an Advocate in Edinburgh previously. It seems Matilda did not see much of her father during these early years, as he was forever busy on the Duke's business around the estate, although there were apparently rooms in Dabton for him to administrate the estate. She mentions as a child remembering how he often had to go to the lead mines in Wanlockhead on business and used to bring back sheets of skimmings from the melted lead, which apparently gave off an iridescent light, which she was very taken with. Looking back on that now, it seems strange, but that is coloured by what we know today about the toxicity of lead. Matilda's mother was a good artist and a lot of her watercolours can still be seen at Lacock Abbey today. At Dabton she had a a room in which she painted near the nursery and according to her daughter, could paint equally as well in oils as she could in watercolour. Not content with painting, was also a botanist and was a member of The Scottish Cryptogamic Society, which these days is incorporated in The Botanical Society of Scotland. So, one parent was more than fully occupied with work and the other was talented in more than one field. Together they were pretty daunting role models. One interesting little passage in the life of the young Matilda, was when she took exception to the way a postman was consistently maltreating his horse, as he drove the horse and gig on his rounds. What really seemed to annoy her, was the fact that nobody seemed to be prepared to do anything about it. So, she decided to do something about it. She found an old pistol in the house and lay in wait for the postman one morning. As he approached the house she stuck the pistol through a gap in the door, took aim and pulled the trigger. Fortunately for her the gun wasn't loaded. It simply hadn't occurred to her that a gun had to be loaded. Shortly after this, the postman left the district, so our potential vigilante was able to continue with her normal life. About the only time Matilda mentions a date and this was probably because it was so significant to her, was the visit the family made to Lacock Abbey in 1877, when she was six. She remembers her grandfather, Henry Fox Talbot as 'a very kind and friendly old gentleman'. On the other hand, she was 'not so much drawn to my grandmother; she looked very severe'. Mealtimes at the Abbey for the young visitor seemed to be very serious affairs. During this visit she met Amélina, or Lalla as the children called her, for the only time, but the Talbot families French governess clearly made a lasting impression. Matilda paints a word picture of her as sitting in an armchair in the Abbey's Upper East Bedroom, with a soft white wrap around her shoulders. She apparently also had bright dark eyes and wavy white hair. Matilda's home life does seem to have been slightly disconnected, but this was not that unusual for the times. It also casts light onto some of the actions of her later life. She said that there was a certain amount of Victorian severity in the home, but it was partially offset by her mother's openness and defence of liberty. She also apparently spoke French as naturally as English. When her father died she wasn't allowed to go to the funeral. She said of her father's death, "I could not say that I missed him, he had always been so busy and latterly had been so much away from us, that we had become accustomed to his absence." They had to leave the large estate house and move back to the much smaller house at Speddoch. As a result of her father's passing, finances were tight. She was terrified to go into the bank with her mother in case she were to be held hostage until her mother repaid the money that was owed to the bank. She continued to retain a healthy apprehension about going into banks for many years. She was then sent to stay with her mother's sisters, Rosamond and Ela in Kensington, where she was to attend school, in order that Matilda might "become rather more civilised". The young Matilda attended Sunday services with her two Aunts at St.Mary Abbots Church in Kensington. There is a watercolour of this church by Rosamond at Lacock Abbey today and intriguingly shows a Hay Cart in the street by the church. Imagine the chaos that would cause in the modern day Kensington! Matilda seems to have got on very well with her Aunt Rosamond, but she returned to Scotland in the summer, as she had continual ear problems and remained deaf in the right ear until she was 17. Some time later and while staying with some family friends, Matilda visited the construction site of the Forth Bridge, which was built between 1882-1890. It is not clear exactly when this visit took place, but it was most probably towards the end of the bridges construction, sometime in 1889-90, which would make Matilda about 18, or 19. During the visit she went right to the top of one of the cantilevers. It was apparently a very windy day, with the wind whipping in from the North Sea. As there was no parapet at the summit, Matilda says that they had to be very careful. When the small group came down from the heights, the culmination of their visit was to walk from one end of the bridge to the other. There was one small snag however, in that the permanent way had not been completely finished and when they got to the centre Matilda "just had to walk on the framework of open squares, through which the water of the Forth could be seen 130 feet below us". They then continued on and having just safely negotiated the open squares, a riveter working high above dropped a red-hot rivet, which apparently just missed her. This illustrates just how dangerous the site was at the time. During the construction of the Forth Bridge fifty-six men lost their lives, with several dozen more being killed on the surrounding construction area. It is not clear exactly how many were killed, as amazingly records were only kept of the numbers who perished on the bridge itself. Quite a life forming experience for Matilda. As you will see from the blog, this has turned out to be more complicated than I first thought. The lack of information in the public domain being the main problem. So, I will be splitting Matilda’s story into sections. Initially concentrating on the period before she arrived at Lacock Abbey. Researching for this article, I found myself wading through Matilda's autobiography, "My Life and Lacock Abbey"1 for the second time. Against expectation, it turned out to be really useful in getting some sort of an idea of what sort of person she was. It was the little stories that tended to give an informative insight into her world. Although, as she doesn't give you much of an idea on days, or dates, a lot is left to the imagination.